Collar bone (clavicle) fractures are fairly common, especially among active individuals. The clavicle serves as the attachment point for several muscles and provides support for the shoulder to optimize function. Recent orthopedic studies have found that non-operative management is usually acceptable, but can lead to disability or lack of healing in clavicle fractures that are poorly aligned. As a result of this research, more orthopedic surgeons are opting for surgical treatment of these injuries. This has led to faster return to activities and better overall function. (JBJS 2007; 89(1):1-10.) Furthermore, deformity of the clavicle after fracture can lead to cosmetically unacceptable results because of how close the clavicle is to the skin and how visible it is with certain types of clothing. This is especially true for women. Unfortunately, the surgical treatment to realign the collar bone fractures often requires a large incision directly over the clavicle. It is also common for patients to have a numb area of skin around the surgical scar from nerve damage that is difficult to prevent. 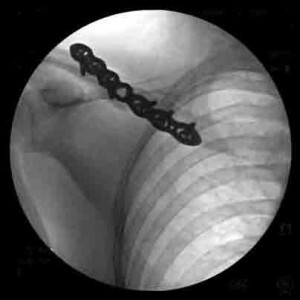 A thick metal plate is then used to stabilize the bone (see image below). This plate is prominent, can be painful, and often requires removal. 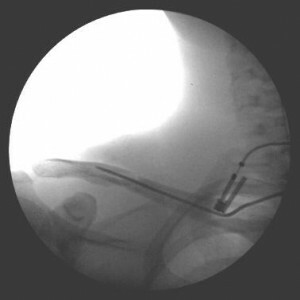 At the Hand Center of Nevada, Dr. Gluck has been trained in minimally invasive, percutaneous treatment techniques to fix collar bone fractures. Through a 1-2cm incision, a rod measuring no more than 2-3mm in diameter is introduced inside the hollow portion of the clavicle. The rod is advanced across the fracture and cut below the skin(see image below). If necessary, the rod can be removed later through the same cosmetic incision. Scarring and nerve damage are minimized with this approach. Christopher Ahmad MD, Professor and Orthopedic Surgeon at Columbia University’s New York Presbyterian Hospital, highlights this technique in the April 2013 issue of Orthopedics Today magazine. Dr. Jay Keener described this technique to Dr. Ahmad, and it was taught to both him and Dr. Gluck while at the University of North Carolina-Chapel Hill Orthopedic Hospital by Dr. Laurence Dahners, head of Orthopedic Trauma Surgery at UNC. Dr. Gluck serves the Las Vegas and Henderson areas, and specializes in the treatment of all types of clavicle fractures. He is available at HCON for consultation to help determine the optimal treatment for your clavicle fracture. Appointments can be made at 702-798-8585.